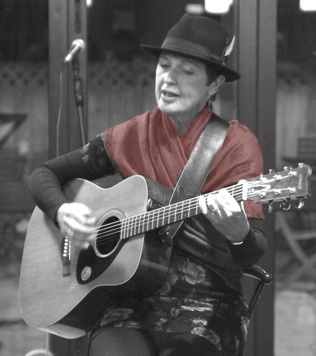 Brenda has been writing songs and playing guitar and mandolin since the 1970’s. She was born and grew up near London (UK), but moved to Australia in 1974, where she lived until 1986, and was passionately involved in the environment and anti-nuclear movements. Her songs were very influential in a number of campaigns, and several have been covered by other artists, or have appeared in documentary film soundtracks. In 1988 she represented Australasia at the United Nations sponsored Asia-Pacific Environmental Song Festival in Bangkok, performing her song For the River. Since meeting her husband, Mark Laurent, in Auckland in 1988, they have mostly performed together, touring throughout New Zealand, Australia and the UK, recording several albums and appearing many times on radio and TV. She also plays mandolin with Waiting for Donald, the occasional musical gathering of Robbie Duncan & Chris Price (from Wellington) with herself and Mark (from Auckland). Brenda’s solo album, Box of Memories, was a finalist for the Best Folk Album Tui Award for 2013. In recent years she has performed in Australia at the Woodford Folk Festival, in the UK at the Green Man Folk Club and the White Horse Folk Club (in Sussex), and in New Zealand at the Auckland Folk Festival, The Mussell Inn, the Dunedin Folk Club, Le Cafe, the Mahara Gallery, Wellington Folk Festival, solo at Hamsterfest (the Hamilton Acoustic Music Festival), Titirangi Folk Club, The Thirsty Dog Folk Club and Devonport Folk Club, Bunker Hill Sessions, Katikati Folk Club, Fairfield House (Nelson), to name just a few.